The grey partridge was @SpeciesofUK from 1st to 8th September, 2013. 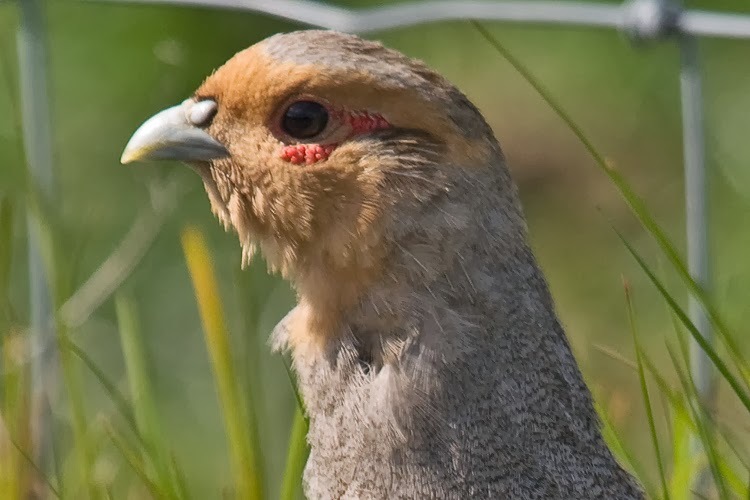 The grey partridge the UK’s native partridge. It is medium-sized, plump, with a distinctive orange face. It is usually classed as a game bird. 'Game' basically refers to an animal that is hunted for food (or sometimes for sport). The grey partridge is found in lowland arable areas. It is most associated with south and east England, but it does reach up into eastern Scotland as far north as Aberdeenshire. The UK population numbers around 70,000 pairs. 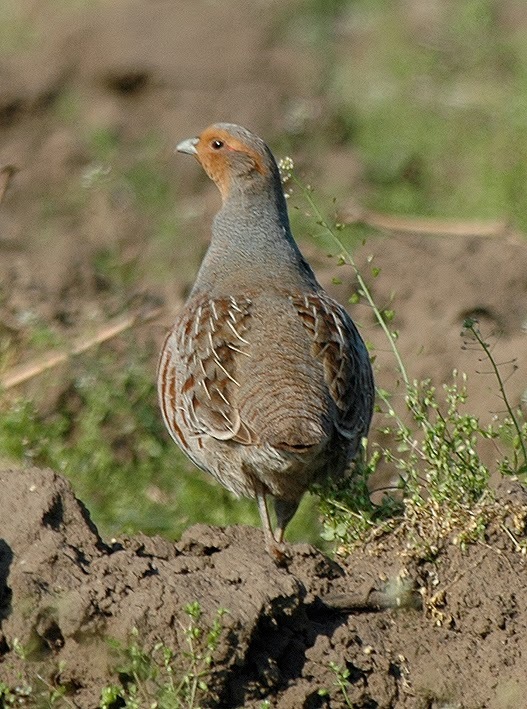 There is also an upland grey partridge population in the rushy pastures of the north Pennines. The grey partridge arrived naturally in Britain as the last Ice Age retreated, meaning it is native to this country. The grey partridge diet includes leaves (grass, cereals, clover), weed seeds, cereal grain, and insects to feed the chicks. The grey partridge is not a great flyer. The grey partridge is said on average to spend only three minutes a day in flight. When it does fly, its wings whirr, interspersed with occasional glides, and a chestnut tail is visible. Grey partridges court early in the year, and by the end of February most pairs have formed. 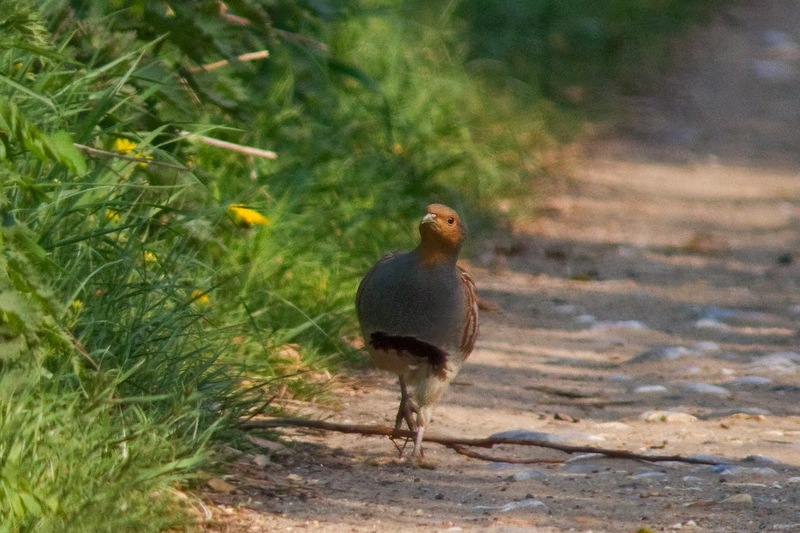 Grey partridge pairs pick their way around hedgerows assessing the ground cover for suitable nesting sites. Males have an obvious dark horseshoe mark on their white underbelly. The nests are shallow scrapes in dense vegetation or even in crops themselves. They tend to be a slope preferably facing south. The grey partridge holds the interesting record of producing the largest clutch of any bird species. 14 to 15 eggs are typical in the UK. In northern Finland the average is a remarkable 19 eggs! Don’t confuse the grey partridge with that other one. The grey partridge is native to the UK and is not to be confused with the non-native, but also quite common, red-legged partridge. Fortunately they don't look all that similar. The grey partridge is at risk. The grey partridge was once very common and widespread, reaching its peak as agricultural land use spread across the UK. In the late nineteenth and early twentieth century, about two million were killed annually in shoots, giving an idea of its numbers. However, in the forty year after World War II, grey partridge number dropped by 80%. Agriculture intensified, grassy nesting cover reduced and herbicides killed the chick’s insect food source. The grey partridge is now an RSPB Red List and Biodiversity Action Plan species and farmers are critical to the success of its conservation. 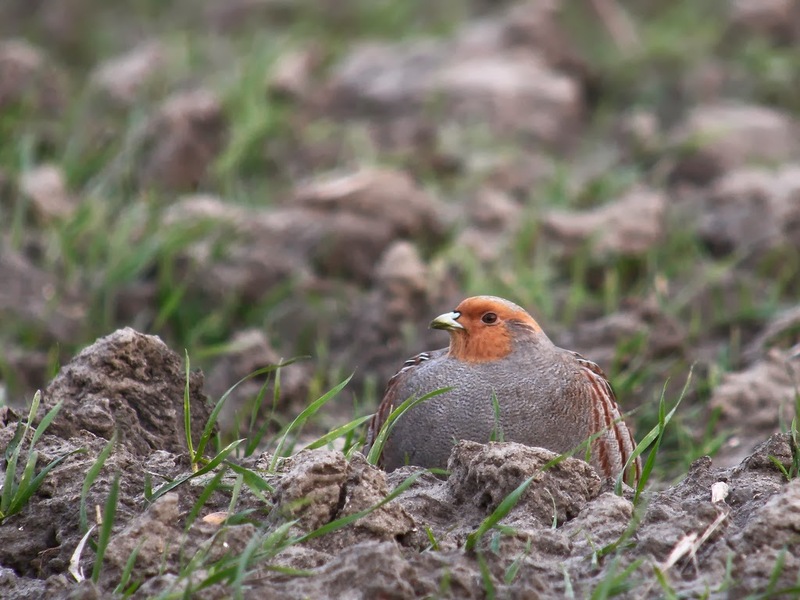 Farmers are encouraged to retain grass cover at hedgerow bases and in large arable fields construct 'beetle banks' for grey partridge nesting. The grey partridge is a game bird and as such is still shot. 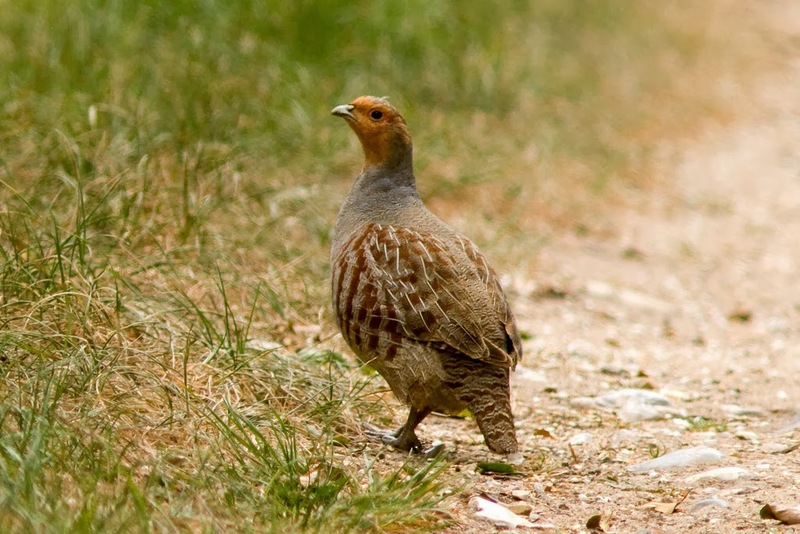 UK game birds include pheasants, grouse, partridges, capercaillie, snipe and woodcock. Game birds can only be killed or taken at certain times of year. The rest of the time is called the 'closed season.' 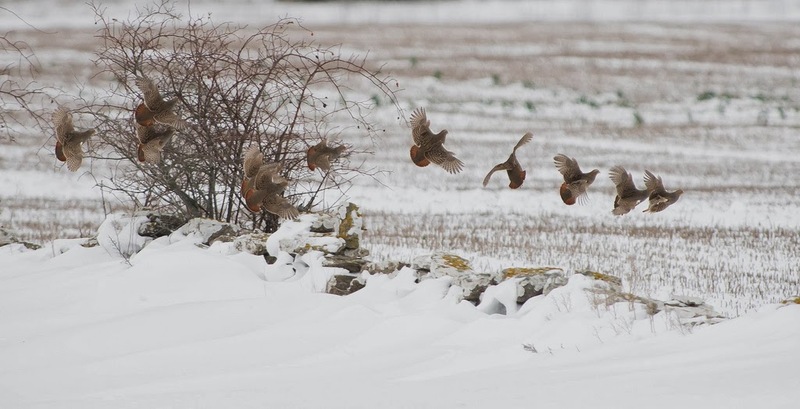 2 February to 31 August is the grey partridge closed season. It is also an offence to take or kill game on Sundays and Christmas Day. 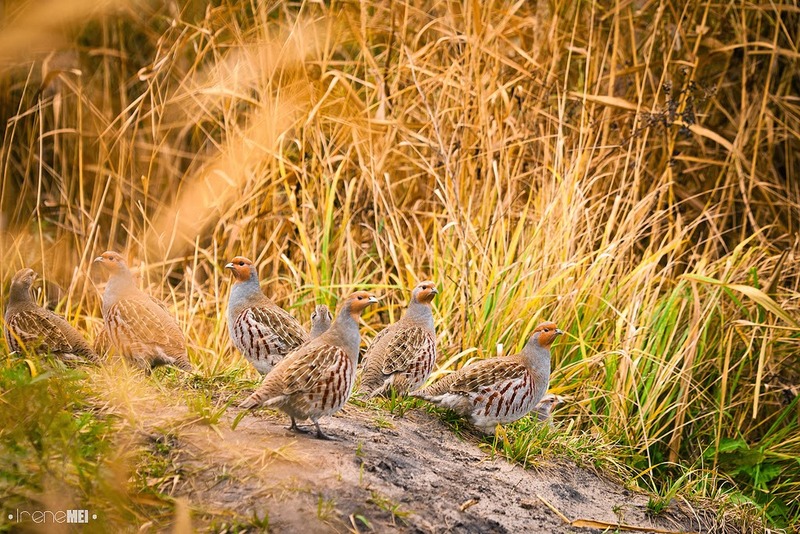 Given its precipitous decline, the grey partridge is no longer shot in the numbers it used to be. The grey partridge should only now be shot where careful management has produced a shootable surplus. 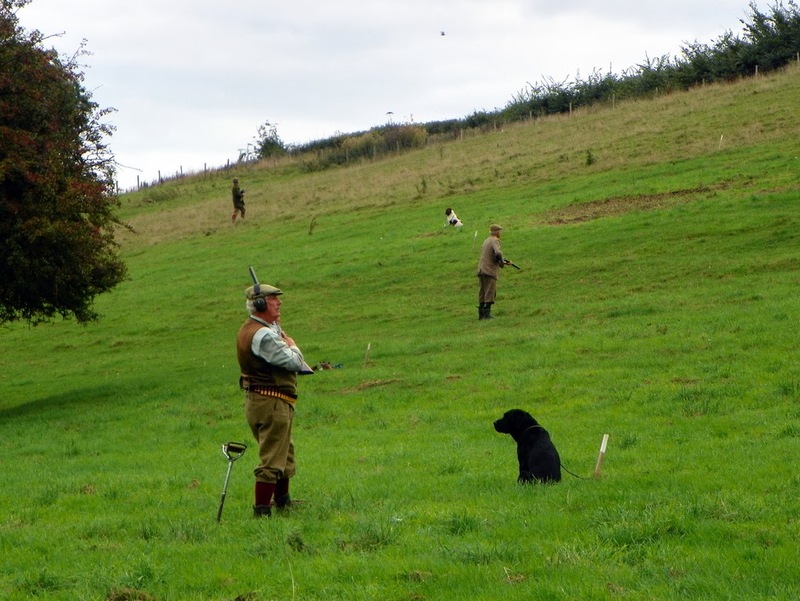 The Game and Wildlife Conservation Trust advises no shooting of grey partridge where the autumn density is less than 20 birds per 100 hectares. I’m afraid, you won't find a grey partridge in a pear tree. They're strictly ground-dwelling. The phrase 'a partridge in a pear-tree' is a corruption of the Latin words 'apertuit in aperto', which mean 'she gave birth in the open,’ referring to Mary giving birth to Jesus Christ. 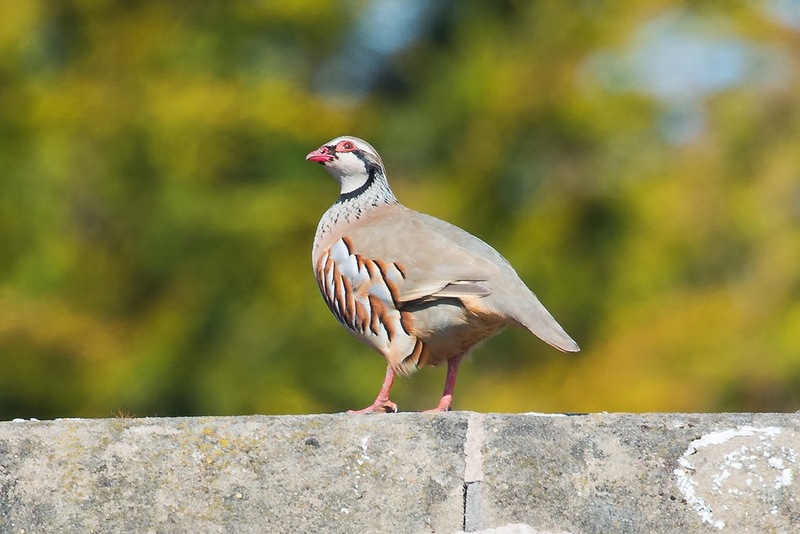 The partridge as a result became a symbol for Jesus in the song Twelve Days of Christmas!